If you need a cast or standard brace, you'll get it quickly and conveniently from our Cast and Brace Department. 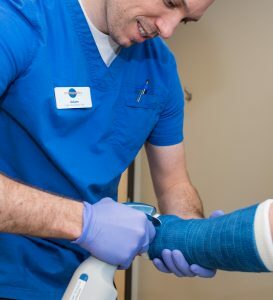 An orthopedic technologist will apply or remove a cast, or fit a standard brace for just about any body part. Call or come in any time during office hours. No appointment is necessary, and wait times are usually less than 15 minutes. Please note that a prescription from a Hope Orthopedics of Oregon provider is required to use our department. The Cast and Brace Department also sells crutches and some other items that may not be covered by insurance. Please note that these items require cash payment upon fit and delivery.